Blair, with Miata designer Tom Matano at Laguna Seca. Eric Jones and Blair Winter met in the early ‘80s while they were high school students in Eugene, Oregon. They each showed more than the ususal interest in cars. Eric could be found modifying and tuning his mk. 1 Scirocco while Blair was rebuilding the 289 V8 in his 1967 Fastback Mustang. Since the late 1980s Eric has worked as a race mechanic, crew chief, and junior engineer in sports cars, Indy cars and stock cars. 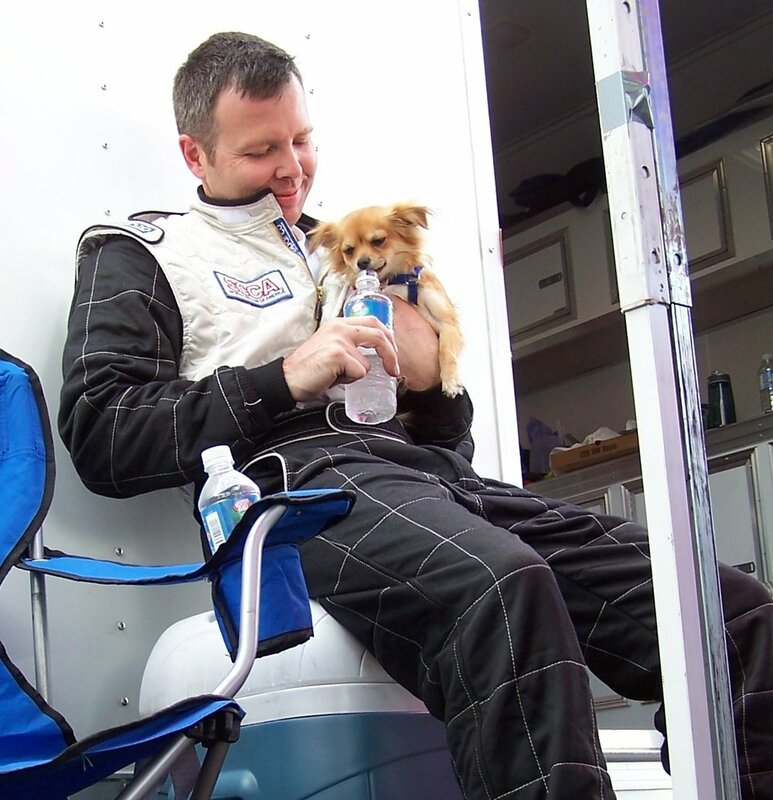 During this time Eric was fortunate enough to test and race many of the cars he looked after, competing regionally, and at SCCA national championship events. Today, Eric owns and operates Eric Jones Motorsports, an automotive repair and restoration shop in Eugene, Oregon, specializing in Porsche and Ferrari road cars, and competition cars of all types. In addition to home-based operations, EJM provides a range of track-based customer support, including engineering, set-up, race support, and driver coaching. Eric also actively campaigns a Mazda Miata in the very competitive SCCA Northwest Region Spec Miata series. A lifelong cycling enthusiast and bicycle racer during his younger days, Blair entered the bicycle industry soon after school, staying there for more than 30 years. The two-wheel career did nothing to diminish his love for all things four-wheeled and gasoline powered speed. Nearly all of the special interest cars Blair has owned over the years were enhanced in some manner in his home garage. Blair has driven his modified vintage BMW to a class championship in the local sports car club’s autocross series. He is also competitive sailor. Blair works for Eric as a mechanic today at EJM. Together, they have launched a parallel venture in which they are equal partners. Rocketworks Sports Cars operates from the EJM facility and has been enthusiastically organized to introduce and distribute Rocketeer Cars products in the United States.